Ashwagandha Root Extract Caps with L-Theanine for Stress & Anxiety Relief - is currently on backorder. You may still purchase now though and we'll ship as soon as more become available. BioSchwartz Premium Ultra Pure Ashwagandha Root Extract works to relax the mind and body without drowsiness. Ashwagandha is a proven adaptogen, a natural substance that helps the body cope with stress. This special blend offers stress and anxiety relief by triggering the adrenal glands, reducing the production of cortisol, the body’s stress hormone and allowing a reduction in anxiety. BioSchwartz Premium Ultra Pure Ashwagandha Root Extract capsules contain L-Theanine. These ingredients work together to improve sleep quality through stress reduction, promoting restful sleep, allowing you to wake up well rested. When used continually, it can also reduce chronic fatigue. With improved sleep comes stable mood, allowing you to be the best you throughout your day. Ashwagandha has been proven to increase focus and concentration of those who take it. When paired with L-Theanine, a naturally occurring amino acid found in green and black tea, these affects are amplified, as L-theanine also improves these abilities, allowing you to work harder without the brain fog that you would normally experience throughout the day. NO FILLERS, NO BINDERS, NON-GMO INGREDIENTS. Using only the latest technologies, we are able to develop an ashwagandha supplement that is 100% pure and natural with Non-GMO ingredients. Our pills do NOT contain fillers, binders, sugar, artificial ingredients, preservatives or chemicals that most brands use today. ALLERGEN FREE & GLUTEN FREE. 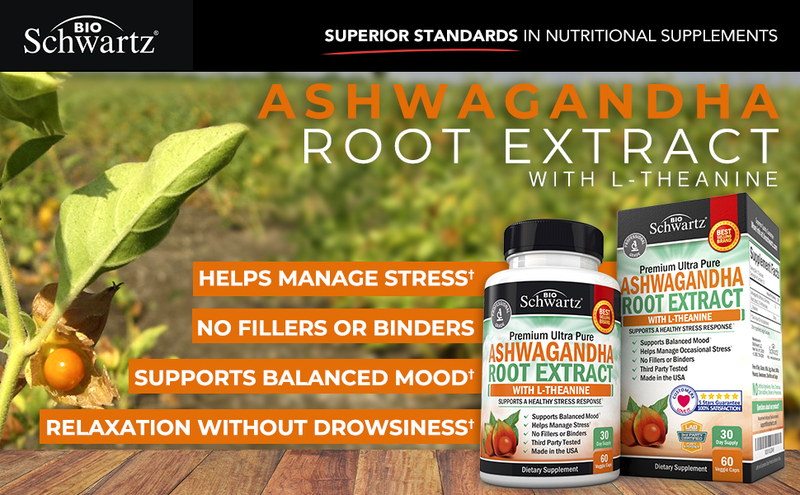 When you buy BioSchwartz Premium Ultra Pure Ashwagandha Root Extract, you can be sure you are getting a professional grade of ashwagandha root extract and l-theanine. On top of our premium formulation, our ashwagandha pills are Gluten free, but also free of the most common allergens such as soy, milk, egg, shellfish, corn, wheat, peanuts and sugar. PROUDLY MADE IN USA. All our supplements are manufactured in the USA. We establish stringent quality control standards in our state-of-the-art manufacturing facility and manufacture all our supplements to exceed expectations set by cGMP (Current Good Manufacturing Practices). Being a Professional Grade Supplement Company means that we use only natural and high-grade raw ingredients, which are routinely tested for purity and quality. TESTED FOR HEAVY METALS. No other brand looks at quality quite the way we do. We devote the time and personnel to verify ingredient safety, and test for purity and quality at multiple steps, all to make sure our ashwagandha is tested for solvent residues, heavy metals, pesticides, and toxins. The result? We created a higher level of purity, safety, and quality for a premium, ultra pure ashwagandha product. PRODUCT SAFETY. While most companies only use 1 or 2 seals, our Ashwagandha Root Extract has 3 seals: an integrity and tamper proof seal to close the box, a pre-perforated neck-band and a heat-induction inner seal. MANUFACTURING PROCESS. During the manufacturing process we analyze samples every 15 minutes and visually inspect every single bottle at the end of the production line. OUR COMMITMENT TO EXCEPTIONAL QUALITY. At BioSchwartz, we create superior products through the perfect balance of the latest technologies, and the purest nutrients nature has to offer. Our mission is to improve the lives of those that trust our high-quality supplements to enhance their health. Integrity and quality steer everything we do, and our commitment to our customers is to produce the highest quality nutritional supplements. With usage dating back to ancient India, ashwagandha is an ayurvedic herb root that has abilities to solve countless ailments and symptoms. BioSchwartz uses root extract which allows the body to absorb the compounds better than when plant parts are ingested or dissolved in liquid, allowing you to feel Ashwagandha’s powerful affects faster. BioSchwartz Premium Ultra Pure Ashwagandha Root Extract Capsules with L-Theanine contain professional grade ingredients that work together to best promote healthy responses to stress and anxiety. These ingredients also create a calming effect on the body without drowsiness, to promote relaxation and mood stabilization. Every ingredient in BioSchwartz Premium Ultra Pure Ashwagandha was carefully extracted and combined to achieve maximum potency and effectiveness. Our supplement is the result of unparalleled science, research, and strict quality control standards that makes us stand apart from the competition.